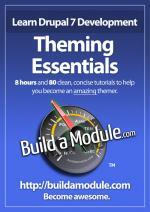 Implied By Design has been providing high-end web design and development services for the past decade, but the founder, Chris Shattuck, is now helping individuals and organization learn Drupal through a collection of no-nonsense, focused video tutorials. If you have come to this site looking to hire a local web design firm to help with your project, because of our change in focus we are not currently available for contracting. However, Drupal is an incredible platform you can use to actually develop a feature-rich web site yourself, or hire a Drupal development firm to assist you with. 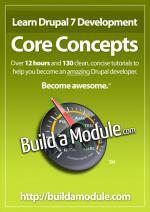 You may find it helpful to take a look at the introductory Drupal video tutorials on Build a Module.com to get a sense of just want you can accomplish with Drupal. While many of Implied By Design's awards were for professional-grade web design, our search engine optimization services, Drupal development and web programming services are also highly esteemed. Implied By Design has been providing high-end web design and development services for the past decade, but the founder, Chris Shattuck, is now helping individuals and organizations learn Drupal through a collection of no-nonsense, focused video tutorials. Click on any of the video collections below to learn more about leveraging Drupal to make an incredibly powerful web site, either on your own or with the help of an experienced Drupal team. 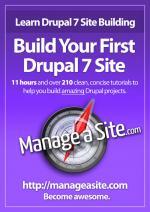 Each on of the Drupal video collections takes you through a structured, laser-focused set of video tutorials. "Thanks again for everything, it's been great working with you." When approaching a project, we try to look at the big picture. What is the client trying to achieve? Who is the site's target audience? What kind of language and imagery will be most effective to convey the right impression to that audience? Once we have a clear direction, we apply our expertise in the fields of web development and Search Engine Optimization to fully develop a site that is intuitive, search engine friendly and targeted. Once a web site is launched, we can help identify what is working and what isn't using web analytics and A/B split testing. Rarely do web sites reach their full capabilities right out of the gate, rather it is a process of testing and refining that will bring about the greatest returns on investment.